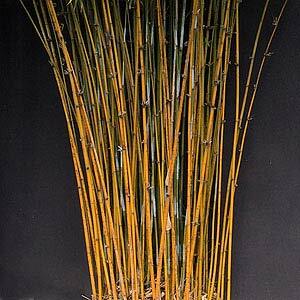 Wholesale Bamboo growers offer a range of species suited for commercial landscapers, real estate developers and retail nurseries. Basically an evergreen grass, it is a plant that is versatile in landscaping uses. From screening plants to feature plants it is grown both for the foliage and the colourful stems or culms which range from green to gold and black. Tall growing species that will reach 10m to low growing types are available. Used widely in commercial landscaping projects it is also suited to Japanese and Balinese landscaping themes. Many varieties are suited to container growth. Bamboo is offered from small bare rooted plants during dormancy in winter. Potted specimens through to advanced sizes are sold ready for planting and these are used for creating an immediate screening effect. Specialist growers can give expert advice on the best variety for your project, looking at location, soil. climate and aesthetic requirements as well as maintenance. For larger specimens in quantities for development projects it is best to order from wholesale suppliers in advance to ensure supply to meet you project deadlines. Landscapers can choose from large, ready to screen potted plants, to culms, which are cheaper to buy and easier to handle, however without the instant effect. Varieties available from Wholesale Growers differs according to location however, species available include.